Brief update this week. Now that I have about 2 weeks to finish this entire project up, I really have to kick up the progress being done each day. This last week was mainly the construction of the new squid, which is almost done except for a few details. Pretty much all the electrical work is complete for the entire attraction, which was a major task (and expensive!). I'm also working towards getting the two first scene totally completed and signed off, and hopefully, they'll be the first scenes to get covered and cleaned up. The main big undertaking that I need to do is get the squid fight completed. Other than that, it's mainly walls, pipes, and rivets. From there I'll do sound and additional interior lighting, as well as the captions for each scene which will consist of a faux book with a page of brief writing and an illustration. I'll get into those later. 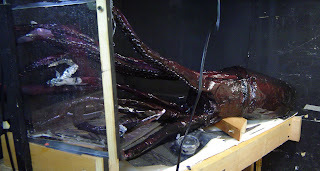 For now, let's look at the squid. The new squid is done out paper mache, mainly to keep the weight down significantly. Yes, that's right, Cheerios! (Fruity Cheerios to be exact). Although they are the wrong scale, they do translate quite well once painted and sealed. I painted the entire squid in a sort of red color, since I tend to associate squids with being a red color, like the infamous "sunset squid" scene. I didn't make it purple this time, but the color didn't seem to matter to me. I then coated the entire thing in Mod Podge gloss medium to give it that wet, slimy look. It looks really disgusting and hideous-- just the right effect! Here it is in the scene with the viewing window on the left. This isn't the best shot, but here's the perspective of the scene, awaiting crew members to fight the squid. I can't wait for this scene to be done and out of the way, it was such a pain to redo. But hey, I need to make this project a spectacle, so everything had to be scaled up and done right. Ironically, Disney redid their squid too! As mentioned, I'm going back to the first two scenes and getting them totally completed. The discovery scene got it's plastic window, basically finishing that scene. 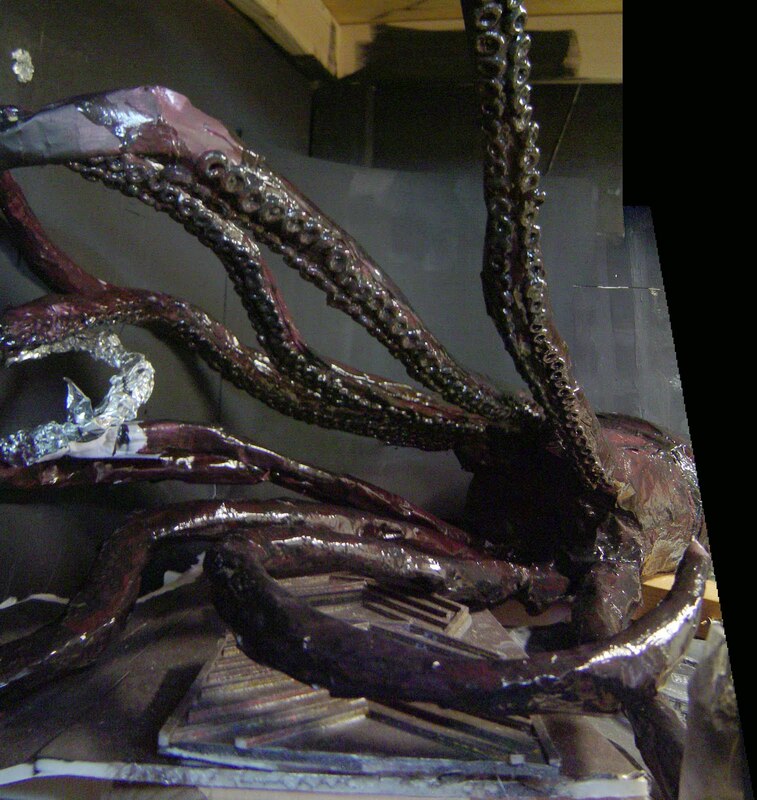 I sprayed it with Testor's dullcote so it gave it that foggy look and makes the Nautilus or the "monster" somewhat hard to see. I'd use fog from a fog machine, but that is such a hassle to control consistently under these conditions. Here's a shot of the first two scenes. Note the framing that has gone in.